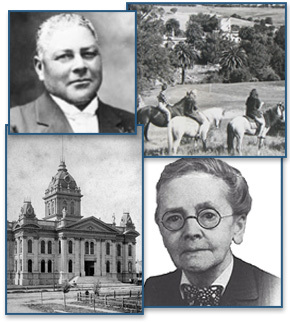 From top moving clockwise: Captain William T. Shorey; Old Hearst Ranch, Pleasanton, circa 1945; Julia Morgan, architect; Alameda County Courthouse, 1875-1936. The Alameda County Historical Society was founded in 1965 "to foster and encourage interest in the history of Alameda County; to publish and to aid in the publication of materials designed to preserve historical data and to increase the general knowledge of the history of the county; to provide opportunities for sociability among members of the Society; and to encourage coordination and cooperation with other history organizations." ACHS is recognized by the IRS as a 501(c)(3), a tax-exempt, non-profit organization. Hosting quarterly dinners with guest speakers on aspects of Alameda County history. Field trips to historically significant sites and communities in Alameda County, such as Mission San Jose, the USS Potomac, and Ardenwood Farm. Producing keepsake publications that are made available free to ACHS members. Keepsake booklets have included The Chinese Laborers of Lake Chabot and The Peraltas and Their Houses. Placing plaques at important Alameda County historic sites. ACHS plaques have been installed at several locations, including the Peralta houses in Oakland and San Leandro and at the Alameda County Courthouse. Assisting in the preservation of the Joaquin Miller Abbey, a National Historic Landmark located in the Oakland Hills. The Historical Society does not currently maintain a research library or archives. Any questions concerning original research should be directed to other, collecting institutions within Alameda County such as the Oakland History Room at the Oakland Public Library or the Berkeley Historical Society. Likewise, if you want to donate historical documents, photographs, or artifacts to an institution, your local historical society or museum can help you identify an appropriate repository for your donation.